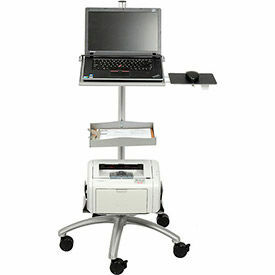 Mobile Stand-Up Computer And Desktop Workstations Are Used In A Variety Of Medical And Industrial Environments. 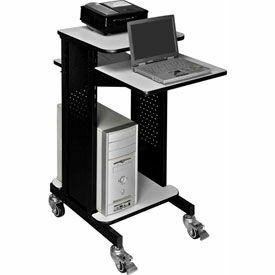 Mobile stand-up computer and desktop workstations are made of high quality materials for strength and durability. Workstations allow convenient computer mobility, storage, and access. Work surface supports monitors, keyboards, and other supplies. Base shelf provides added equipment storage including CPUs, printers, and more. Swivel casters with brakes allow ergonomic unit mobility and accidental roll prevention. Height adjustable for user convenience. Includes integrated cable management openings. Assembles easily. Available styles include Adjustable Height Computer Workstation, Adjustable Height Workstation, Enclosed Bottom Computer Cart, Mobile Computer Cart, Mobile Computer Station, Mobile Computer Workstation, Mobile Computer Workstation/Standing Desk, Mobile Desktop Computer Workstation, and more. Colors are Beige, Birch, Black, Black/Silver, Blue, Charcoal, Cherry, Gray, and more. Dimensions vary per model. This Mobile Laptop Workstation provides easy mobility of a laptop with theft-deterring security bar. Low-profile platform is angled at 10 degrees for ergonomic operation and allows clearance for interfaces. The security bar on the Mobile Laptop Workstation secures your laptop via included included screws or small padlock with a shackle diameter of up to 3/16" (sold separately). The Laptop Security Workstation unit also comes with a retractable mouse tray that can be attached on either side for convenience. The Laptop Workstation platform measures 15-1/2"W x 11-3/8"D and is made of steel affixed to a lightweight and durable aluminum post. 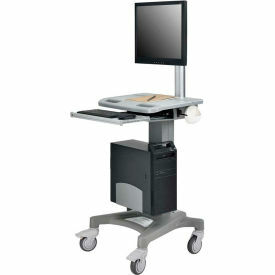 Mobile Laptop Workstation Unit glides smoothly on five 2-1/2" casters (3 locking). Optional document holder and printer stand available. Laptop tray fits typical laptops up to 15" screens. Mobile Battery-Powered Warehouse Computer Workstation Carts Are Mobile Workstations For Inventory Control, Labeling And Printing Areas, Point-Of-Service Operations And More. 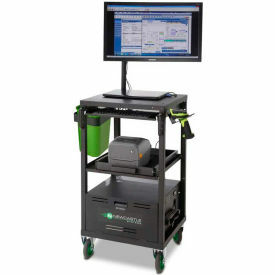 Mobile Warehouse Computer Workstation Carts are ergonomically designed for modular, mobile workstation use and can be configured for a variety of environments including retail, distribution centers, warehouses and medical facilities. Powered seamless rechargeable battery runs up to 4 devices for up to 8 hours for long lasting use. Durable steel upright mast is slotted to accept optional accessories, allow shelf height adjustments from 20" - 40"H, and stores wires for cable management. Optional LCD Mount holds flat panel LCD monitors. Optional Binder Holder conveniently stores books and charts. Includes a full width wrist pad for comfort. Includes top shelf, push handle, and 5" casters (2 rigid, 2 locking swivel). Available accessories are Adjustable CPU Holder, Binder Holder, Keyboard Tray, Laminated Shelf, Laptop/Tablet Holder, LCD Post Mount Holder, Mouse Tray, Scanner Holder, and Surface Mount Flat Screen Holder. Frame color is Black. Dimensions vary per model. Presentation And Projector Stations Are Used For Applications Including Academic, Commercial, Corporate And More. Presentation and projector stations are made of laminate and steel for long lasting durability and dependability. Stations provide audiovisual equipment access and storage for conferences, meetings, presentations and more. Units accommodate notebook computers, LCD projectors, document cameras, visualizers and more. Multiple work surfaces allow application and equipment versatility. Includes swivel casters with brakes for convenient unit maneuverability and stability. Available colors include Aspen, Black, Black/Gray, Blue, Cherry, Gray, Ivory and Walnut. Dimensions vary per model.